Every organization has a What, a How, and a Why. Our What is wealth management and trust services. Our How is through experienced financial advisors building relationships and applying tools such as proprietary financial planning software, investment vehicles, and estate planning strategies. But it’s our Why that sets us apart from other wealth management and trust companies. Why is what motivates us to get out of bed in the morning – it’s our reason, cause, and purpose for what we do. Ronald Blue Trust is not simply a financial planning, investment management, trust services, or estate planning company. We believe we do all of those things with excellence, but essentially seek to help our clients gain clarity and confidence around their finances. And we firmly believe that when our clients live with clarity and confidence about money – without conflict, anxiety, or fear – their lives are richer and more fulfilling. They can envision and act on their Why. The vision of helping people seek and live their Why was one of the cornerstones on which Ron Blue established Ronald Blue & Co. in 1979. Ron felt challenged and called to help people become better stewards of their wealth and have a better relationship with money by using not just technical expertise, but biblical principles as well. Ronald Blue Trust clients have come to us, and stay with us, because they are attracted to our uncommon approach to wealth management. Read more about how we integrate biblical principles into financial planning. We have our own success story – people with a vision and a mission. Learn more about how our founders shaped us into the company we are today. Our leadership team includes individuals with diverse backgrounds in the financial services industry that helped transition Ronald Blue Trust into a nationwide trust company with over $9.5 billion of assets under management and advisement serving approximately 9,000 clients in all 50 states. As of 03/01/19 and subject to change. Nick Stonestreet is the CEO, Chief Investment Officer, and Chairman of the Board. Nick has more than 30 years of financial services experience and has managed a broad spectrum of wealth management businesses. As CEO, Nick is active in developing the company’s strategic initiatives and oversees the overall management of the organization and its divisions. As Chief Investment Officer, he heads the investment department as they develop and implement investment strategies that seek to increase the probability of successfully meeting clients’ financial planning goals. Prior becoming CEO of Thrivent Trust Company, Nick co-founded and was CEO of Vident Financial, an investment management firm. He also served as Regional Head of Private Wealth Management for Regions Financial and before that worked at Merrill Lynch for 15 years in several capacities including Chief Executive Officer of Merrill Banc Suisse & Global Head of International Trust, Structuring, Global Co-Head of Private Wealth Services and Director of Private Banking. Nick received his Master’s Degree in International Business Studies from the University of South Carolina. Terry Chier is the Manager of Personal Trust Services. Terry is responsible for managing and providing leadership direction for the Personal Trust Services team within the trust company. This includes management of the Personal Trust Services team staff and oversight of all accounts where the trust company serves in the role of trustee, co-trustee, or guardian/conservator of the estate. He has a wide array of client service experience with more than 30 years serving in financial services, business management, and client relationship management. Prior to his current role, Terry was a Vice President, Senior Trust Advisor at Legacy Private Trust Company in Neenah, WI. Terry is a member of the Wisconsin Bar and holds a JD from Marquette Law School, an MBA from Georgia State University, and a Bachelor of Business Administration in Finance from the University of Wisconsin-Whitewater. He is also a graduate of the American Bankers Association National Trust School and Graduate Trust School. Wendy Collins is Senior Counsel and Secretary. Wendy oversees the regulatory compliance program for the organization. She has over 20 years of experience in banking law and compliance including as a bank examiner, bank compliance officer, and practicing attorney advising on bank compliance programs. Wendy graduated from the University of Wisconsin-Milwaukee with a Bachelor of Business Administration in Finance and is a graduate of the Wisconsin School of Law. She holds the designation of Certified Regulatory Compliance Manager and Certified Fiduciary and Investment Risk Specialist. She is also a member of the Wisconsin and California Bars. Alan Cox is the Director of Estate/Trust Planning and Estate Settlement. Alan and his team are dedicated to providing a high level of service and professional expertise to clients in the specialized field of Estate/Trust Planning and Estate Settlement. They provide estate and charitable planning, design, implementation, and administration. Prior to joining the company, Alan was in charge of an estate planning practice for an Atlanta-based CPA firm. His experience also extends into a legal setting in the estate tax division of a law firm in Chattanooga, Tennessee. Alan earned his B.S. in Accounting from Tennessee Temple University and is a Certified Public Accountant (CPA) and Certified Kingdom Advisor®. Russ Crosson is Executive Vice President and Chief Mission Officer of Ronald Blue Trust and Executive Vice Chairman of the board of directors for Thrivent Trust Company. Russ serves as chief advocate for the heart and soul of the organization and works to ensure the mission of the company is carried out with integrity in every area of the organization with a focus on making sure the company’s mission is passed down and inculcated into future generations. Prior to his current position, Russ served as President & CEO of Ronald Blue & Co. from 2002 to 2017. He was hired by Ron Blue in 1980 as the second employee of Ronald Blue & Co. He has worked extensively in all areas of financial planning - specializing in comprehensive financial, estate and philanthropic planning, as well as generational family wealth management and transfer. From 1999 – 2002, Russ served as Executive Director of the National Christian Foundation. Russ graduated from Kansas State University with a BS in Mathematics and a Master's degree in Education. Russ is the author of several books including Your Life…Well Spent, The Truth About Money Lies, and What Makes a Leader Great. He has also been a featured speaker in many venues including Promise Keepers, Issachar Summit, and America’s Best Hope. Valerie Evensen is the Manager of Trust Operations, Vendor Management Officer, and Physical Security Officer. She is responsible for the day-to-day coordination of the department’s trust operation activities and oversees the management of all third party service providers. Valerie has over 20 years of trust operations experience and has been with Thrivent Trust Company for 17 years. She is a Certified Securities Operations Professional and holds a Bachelor of Science in Business Administration from the University of Wisconsin-Oshkosh. Dana Kloes is the Director of Human Resources. She is responsible for developing, guiding, and directing the people practices of the organization in accordance with Ronald Blue Trust’s principles, philosophies, and policies and consistent with guidelines established by government and regulatory agencies. Dana leads strategic human resource people development and planning processes to position the organization as an employer of choice in our industry. Prior to joining Ronald Blue Trust, Dana worked for MagMutual Insurance Company as Director of Human Capital, and before that, she served as Director of Human Resources at AssuranceAmerica Corporation where she managed all human resource functions. Dana earned her Bachelor of Arts from Georgia State University and completed the Human Resources Certificate Program at Kennesaw State University, College of Continuing Education. Dana has a Senior Professional in Human Resources (SPHR) designation and a Society for Human Resource Management, Senior Certified Professional (SHRM-SCP) designation. Larry Korchan is the Director of Investment Operations. He is responsible for daily investment operations, professional development of investment operations staff, and management of operational business partners. Larry’s security industry experience encompasses the operational development of new brokerage products and servicing them in a large global branch network. Prior to his current role, Larry was the Director of Operations for INVESCO Retirement, Inc. in the defined contribution industry. Larry also served as Vice President of Operations for Merrill Lynch, where he spent over fourteen years. Larry earned his Bachelor of Arts in Communications from the State University of New York. Brian McClard is the Director of the Investment Strategy Group (ISG). Brian and his team develop and implement investment strategies for the company that seek to increase the probability of successfully meeting clients’ financial planning goals. The ISG is responsible for constructing model portfolios, selecting investment instruments, and performing ongoing due diligence of those investments. Prior to joining the company, Brian served as Chief Investment Strategist for Voisard Asset Management Group, an investment and wealth management firm. He also served at Fifth Third Bank as a portfolio manager. Brian earned a dual Bachelor of Science degree in Finance and Accounting from the University of South Florida and an MBA focusing on international management from the Thunderbird School of Global Management. Brian holds the Charted Financial Analyst® designation and is a member of the CFA Institute. Sandy Morgan is the Director of Branding & Communications. Sandy is responsible for enhancing the national branding strategy of the company as well as developing external communications and key marketing initiatives. She works to ensure the company’s messaging, content, and materials accurately express Ronald Blue Trust’s value proposition. She looks for and evaluates new opportunities to increase brand awareness and manages the company’s public relations strategy. Sandy joined Ronald Blue & Co. (the predecessor company to Ronald Blue Trust) in 2012 with more than 20 years of experience in financial services communications, branding, and marketing. Prior to joining the company, she served as the Managing Director of Field and Acquisition Marketing for Charles Schwab Institutional Services. Sandy earned her B.S./B.A. from the University of North Carolina at Chapel Hill and her MBA in Finance from Georgia State University. Jesse Ostrom is the Chief Fiduciary Officer for Thrivent Trust Company, including its Ronald Blue Trust division, and also serves as President for Thrivent Trust Company. Jesse has worked in the trust services industry for nearly 20 years. As Chief Fiduciary Officer, Jesse leads Advisor Services including Estate Planning, Personal Trust, Estate Settlement, Fiduciary Tax, and the team that supports SIMPLIFY, the company’s unique personal financial management service. He also heads the Institutional and Private Client groups for Thrivent Trust. Jesse joined Thrivent Financial Bank in 2010 and helped transition the trust team from a department of the bank to an independent trust company in 2012. Since then he has served in several leadership positions for Thrivent Trust, including CEO and Board Chair. Jesse is a member of the Wisconsin Bar and holds a JD from University of Wisconsin Law School and a BS in Industrial Engineering from University of Wisconsin-Milwaukee. Kevin Payne is the Director of Enterprise Business Solutions. He is responsible for leading the company’s Enterprise Operations and Financial Planning departments. In this role, he proactively seeks ways to leverage and integrate business systems in a manner that enhances efficiencies and minimizes duplication of efforts. Kevin and his team strive to implement key business solutions that enhance the client experience, maximize team member efficiencies, and ensure business information and operational needs are met. Prior to his current role, Kevin was CEO of Metago, a mobile apps and software company with 130 million global users, for nine years and President for seven years. During his time at Metego, he oversaw the growth of the company from start up to acquisition. Kevin earned his bachelor's degree in Computer Engineering from Georgia Institute of Technology. He earned his MBA from Georgia State University where he completed their Executive Global Management program. Brian Shepler is the President and Executive Vice President of Client Services. As President, Brian oversees the day-to-day management and strategic development of the company. As EVP of Client Services, he supports the entire field organization and its divisions by reinforcing best practices related to corporate culture, growth strategies, advisor compensation/incentives, and compliance. In addition, Brian leads the talent acquisition and development function for the company. Leveraging his background in the investment banking and private equity fields, Brian primarily serves Ronald Blue Trust clients who own family businesses, providing advice regarding business succession, strategic growth planning, and corporate capital planning. Brian began his career with Goldman, Sachs & Co. in New York and came to Ronald Blue & Co. (the predecessor company to Ronald Blue Trust) in 2000 from SunTrust Banks, Inc., where he served in various roles in the investment banking and equity research divisions. He received a BA in Mathematics from DePauw University and earned an MBA in Finance from the University of Chicago. Larry Smith is the Director of Information Technology. Larry provides vision and leadership for designing, developing, and implementing information technology initiatives across the company. He is responsible for influencing and directing the company’s information security, network infrastructure, and applications evolution to ensure key business strategies and processes are driven by systems that enable change, growth, and flexibility. Larry joined Ronald Blue & Co. (the predecessor company to Ronald Blue Trust) in 1994 and has held various positions within the company including Sr. Manager of Software Development, IT Project Manager, and Manager of Web Services. Larry is a Certified Information Systems Security Professional (CISSP). Lisa Weiden is the Director of Financial Operations. Lisa provides leadership to the company’s finance department which is responsible for managing the accounting operations of the company, including planning and reporting, and for coordinating and administering the operational and finance functions between business units. Prior to joining the company, Lisa served as an Audit Manager for a public accounting firm in the Atlanta area. 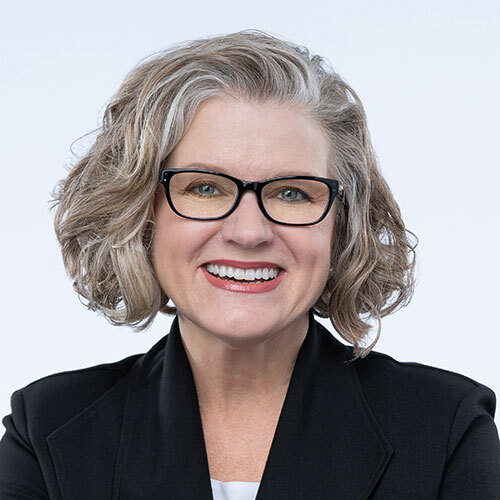 Lisa earned her BA in Accounting from the University of St. Thomas in St. Paul, Minnesota and graduated with her MBA in Finance & Accounting from the University of Minnesota’s Carlson School of Management. Lisa is a Certified Public Accountant, Certified Internal Auditor, and a Chartered Global Management Accountant. Mike Woldt is the Manager of Business Development and Financial Management Services. Mike leads the business development activities for Institutional, Private Client, Estate Planning, Personal Trust, Estate Settlement, and Financial Management Services, the team that supports SIMPLIFY, the company’s unique personal financial management service. In addition to leading business development activities, Mike oversees the Financial Management team responsible for providing client service to Private Client, Institutional, and SIMPLIFY clients. He has more than 30 years of experience in the financial services and investment management industries. Mike is a graduate of St. Norbert College and AIMSE/Wharton Investment Institute. Sr. Private Wealth Advisor - Ops. Mgr. What constitutes a life well spent? Is it riches or enrichment? Is it your prosperity or the legacy of your posterity? Who measures your life well spent – you, or others in your life? Is there a point where faith and finances intersect in a life well spent? These questions inform the essence of who we are and what we do. With nationwide trust capabilities, Ronald Blue Trust provides wealth management strategies and trust services based on biblical principles, with one goal: empower our clients to make wise financial decisions, live generously, and leave a lasting legacy. We serve people across the wealth spectrum, from individuals who need everyday financial advice to multi-generational families who require complex family office services to business owners who need custom consulting services. Believing that biblical principles are the best guide for making wise financial decisions, we strive to help you achieve both the financial goals and the clarity and confidence to live your life well spent. Ronald Blue Trust advisors in 14 offices around the country provide a full complement of services – financial, retirement, estate planning; investment management and solutions; charitable giving strategies; personal trust and estate settlement services; bill paying services; family office services; business consulting services; and institutional client services. We build relationships of trust with our clients, speaking to some of the most financially intimate areas of their lives. Ronald Blue Trust offers fee-only financial advisory services and has over $9.5 billion of assets under management and advisement and serves approximately 9,000 clients* in all 50 states. Our ultimate goal is to help clients make wise financial decisions, live generously, and leave a lasting legacy. To learn more about our company, click here to view our corporate brochure. *As of 03/01/19 and subject to change. We help with more than just financial decisions. We help with life decisions – for your life well spent. Our advisors tell you how. Managing Director Hunter Pugh began working with Ronald Blue & Co. in 1987 and opened the Charlotte office for the firm in 1994. The office has grown to six advisor teams serving clients throughout the Carolinas and the Southeast. The financial professionals in the Charlotte office of Ronald Blue Trust have an average of 19 years of experience in providing financial advisory services and a deep network of professional relationships, enabling them to assist their clients in making wise financial choices consistent with faithful stewardship. The Charlotte office serves more than 615 clients with combined assets under management in excess of $594 million. Ronald Blue Trust, a division of Thrivent Trust Company, announced today that PlanFIRST, a registered investment adviser located in Greenville, S.C., is joining the organization. The move will expand both companies’ reach as they aim to serve more clients and help them make wise financial decisions. Ronald Blue Trust has partnered with Church Law & Tax, a publication of Christianity Today, to provide content for ChurchSalary. Released this month, the tool features compensation best practices and guidance on personal financial topics, including budgeting, debt management and retirement planning. Ronald Blue Trust has named three of its managing directors to newly created regional managing director roles, to support its continued growth in helping clients make financial decisions in keeping with their faith and values. Ronald Blue Trust has promoted three of its leading advisors to managing director roles, to ensure continued excellence as it helps clients make financial decisions in keeping with their faith and values. Thrivent Trust Company has welcomed three new board members to help guide the company’s leadership team as they work to enable clients to make financial decisions consistent with their faith and values. Joining the board are former corporate attorney Kim King, pastor and author Dr. Crawford W. Loritts, and former gubernatorial Deputy Chief of Staff Marilee J. Springer. Ronald Blue & Co., one of the largest, fee-only independent wealth management firms in the U.S., has joined with Thrivent Trust Company, a subsidiary of Thrivent Financial, to offer a comprehensive suite of services through a nationwide trust company to assist individuals and families in making financial decisions consistent with their values.